Slightly dated by its burgeoning sentimentality, Three Brothers is still an intriguing and heartfelt work by one of the great Italian film directors. Three brothers return to rural southern Italy help their ailing father (Vanel) cope with the death of their mother. Activist factory worker Nicola (Placido) brings his young daughter Rosaria (Tafuri), who scatters natural light wherever she goes. 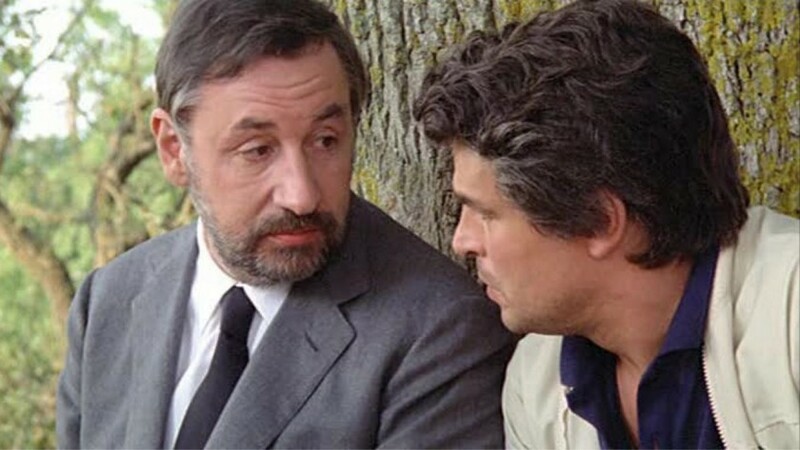 As she explores the nostalgia-tinted rural farm, Nicola argues politics with older brother Raffaele (Noiret). Rafaelle is a judge whose conservative tendencies have been consolidated by a string of (real-life) assassinations of judges and other state officials, supposedly by left-wing terrorists. Both Nicola and Rafaelle fret about wives and their networks of acquaintances as much as they do about politics. The third sibling, Rocco (Mezzogiorno) is a teacher of urban children with behavioural issues. Because of a lack of ties back in the city, he acts as grounding for the film, watching his brothers argue and grieve and enabling us to see the sentimentally charged details of the father’s life. In the build up to their mother’s funeral, all the male characters experience daydreams which highlight prosaic or existential fears, beautiful memories and, in the case of Rocco, a bizarre musical fantasy. As someone who was utterly bowled over by the recent releases of two of Rosi’s earlier films, Salvatore Giuliano and Hands over the City, I found Three Brothers a disappointment. There’s no denying there are some lovely shots of the rural environment and some intriguing sequences showing aspects of that life that must have been fast disappearing even back at the end of the 70s. But the film has none of the urgency of the earlier films – the whole thing bathes too long in Piero Piccioni’s over-lush score. Without that urgency, and with an atmosphere of moral judgement (lacking from the earlier films) that teeters on the brink of conservatism – it is hard not to see Rafelle’s political perspective as the film’s own – the film feels like lots of other arthouse films from the 80s, made by disgruntled middle-aged men with radicalized back stories. There are several beautiful, simple images that lose power because of their association with the score. I’d say the scene with the mother’s leave-taking is a masterclass in what not to do with film music. The 2K resolution is adequate but the original mono audio is jarring in its low fidelity – my speakers are for merda, though. Three Brothers was a crossroads film for Rosi – he only made glossy literary adaptations afterwards, all of them distressed with elements of grimy local colour. Three Brothers is out now on Blu-ray and DVD.